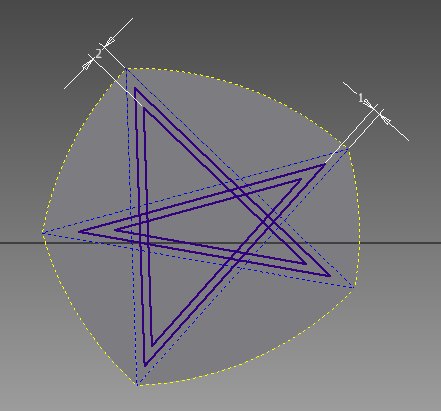 In a previous post we’ve seen how to build Reuleaux polygons from regular polygons. While already intriguing they were still regular. Now we will see that in fact we can start from the same base and build non regular constant width 5 sided polygons (There is no degree of liberty with 3, and I’m not doing with 7+ but it would work the same). Here is how to build them with inventor. Set the length of one segment with a name (I’ve used length = 40mm to get wheels compatible with the previous article). Then use equal constraint to fix all segment to the same length (You can hid the constraints back with F9). Pass all the segments to construction and draw thee points arcs from each vertices to get the outline of the Reuleaux polygon. 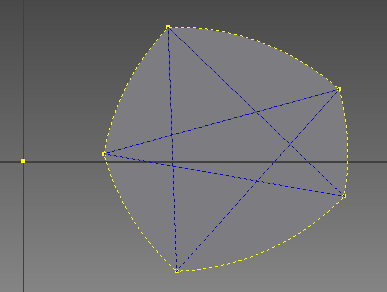 Remark that, because of the constraints you can pull any vertex and deform the final shape. You can copy multiple time the initial shape and deform it to have strange wheels. Before finishing the sketch, make sure to run a “sketch doctor” to close any open loops, otherwise you won’t be able to extrude the wheels. Now extrude the wheels. Now we will add on one face of the wheel a embossed version of the start. To do that (repeat for each wheel), create a new a 2D sketch on one face. If the face outline was not projected in the sketch, use project geometry to do it. 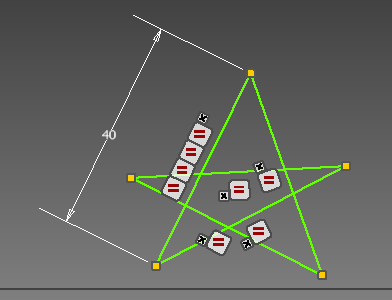 Change all the line (and origin if available to construction then draw the 5 point star with the construction switch ON. 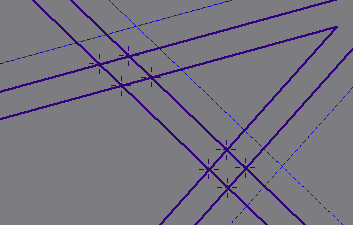 The current profile are intersecting so to be able to extrude/emboss them you have to add “points” to all the intersections. Once done exit the sketch. 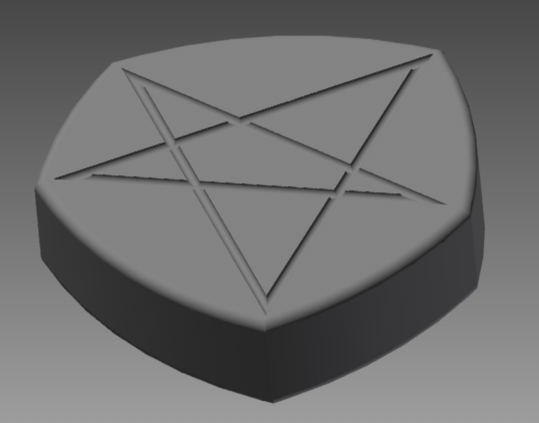 Extrude or emboss 0.5mm deep the star, then add a 0.5mm filet on the star and a 1mm fillet on the outside edges of the wheel. (if you select the ‘all fillets’ option, you can capture all the star filet at the same time so no need to select one after the other). Here it is, you have a set of non regular wheels compatible with the previous ones. This entry was posted in 3D printer, Autodesk Inventor, Impossible Objects, STL files and tagged 3d printing, Autodesk Inventor, impossible objects, stl files on March 15, 2013 by damienideas.